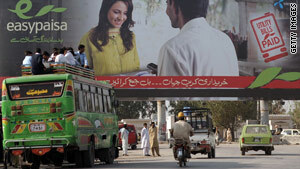 Easy Paisa in Pakistan tied a mobile operator to a micro-finance bank, offering banking opportunites to millions. (CNN) -- Imagine your life if you had no access to banks, ATMs, credit cards, or savings and checking accounts -- just cash that you needed to hide or carry around. It would be hard to save, plan, get ahead, take chances, or feel secure. For billions of poor people in the developing world, that's how life has always been -- and it's a big reason why many have remained poor. And because they're poor, banks steer clear of them. In recent years some mobile operators in emerging markets -- most notably Safaricom in Kenya with its profitable M-Pesa service -- have made a splash by allowing customers to send remittances and pay bills via SMS. So far so good: millions of lives are much better for it. But what about savings? For telecommunications companies, that part is trickier. "Regulators see savings as belonging to banks," notes Samee Zafar, director at the consultancy Edgar Dunn & Company in London. "Where they're willing to give way as far as pure payments and money transfers are concerned, I think savings is going to be a much bigger battle against the regulators." As a result, partnerships between mobile operators and banks might become increasingly common in the developing world. Such an approach requires open minds. In the future if I want to send you money, the only thing I need to know is your mobile number. Three or four years ago, wireless carriers tended to put banks down or to see them as competition, says Kabir Kumar, an analyst at CGAP, a microfinance center based at the World Bank. No longer. Now, he says, "the question is, 'You have to work with banks -- how do you do it? How do you get the most out of it?' In some cases, you have very aggressive tie-ups and relationships." One example of that is the partnership between mobile operator Telenor Pakistan and Tameer Microfinance Bank. Together they launched a service called EasyPaisa in October last year. Like M-Pesa, EasyPaisa offers remittances and bill pay -- it's already handled more than 270,000 bill-pay transactions. But that's just a warm-up. Within the next two months it also plans to launch a mobile-account service that features savings and withdrawals. Anyone in Pakistan with a Telenor connection -- about 22.5 million people -- will be able to open a bank account at an EasyPaisa merchant. They'll be able to cash in and cash out at such merchants, too -- no bank branches required. Some 89 percent of the adult population in Pakistan is unbanked and 62 percent use mobile-phone services, notes EasyPaisa spokesman Affan Haider. Telenor "can offer savings accounts because they actually went and bought a bank which has a full banking license," says Zafar, whereas Safaricom "can't really open a bank account for anybody." So in some ways, he says, EasyPaisa is probably the model for the future, and not the M-Pesa model. The latter has received far more attention and that's been justified. "M-Pesa has been phenomenally successful," says Zafar. "They have shown that this is a true revolution." The impact of its success is hard to measure, but lately this sector has been going full steam ahead. For instance, supported with a $35 million grant from the Bill & Melinda Gates Foundation, the Alliance for Financial Inclusion (AFI) was officially launched in September 2009. Made up of policy-makers from developing countries AFI says it is "committed to making savings accounts, insurance, and other financial services available to millions of people living on less than $2 a day," according to a press release. One of the key lessons already being shared is the importance of a solid network of agents who can accept and dispense cash. "The bedrock issue is cash conversion," says Kumar at CGAP. "How do you set up a network of agents where you can get cash in and out of those accounts?" With EasyPaisa, merchants are trained, motivated by commissions, and carefully selected based on factors like whether they have cash flows suitable for the region they're operating in. Telenor has plenty of merchants to choose from -- about 150,000. It expects to have 20,000 participating in the EasyPaisa program by year's end, says Haider, adding that the entire banking network in Pakistan, by contrast, consists of close to 8,500 branches. While EasyPaisa, M-Pesa, and other such services around the world are significant developments, some bigger industry players are looking at the global picture. "Today what you see in the implementation is mainly one bank, one operator," says Gerhard Romen, director of financial services at Nokia. The paradigm of the future, he says, is: "If I want to send you money, the only thing I need to know is your mobile number." Details like which bank, mobile operator, or even brand of cell phone you're using won't matter, he says. Nokia is stressing the need for an open platform -- which it says its Nokia Money service will be -- and cooperation among all types of players, each of whom brings their own strengths. Nokia Money will launch in unspecified emerging markets in the first half of this year. In the meantime, a largely untapped market awaits. There are about 1 billion people across Asia, Africa and Latin America who do not have a bank account but do have a cell phone, according to CGAP and the GSMA. In a few years that number that should reach 1.7 billion.